I don’t know anything about advertising except for what I’ve learned watching Mad Men. When I taught an economics course to high school seniors years ago (long before Mad Men), we spent a few days talking about advertising in a unit when my students designed their own business plans. Since I didn’t know what I was talking about then either, I chose not to talk much on the topic, and instead, late at night on Super Bowl Sunday, I sat at my VCR (remember those?) and video-taped the commercials off of my then-so-innovative DVR. It took forever to prepare that tape of Super Bowl ads and I would have given anything for something like YouTube, which came a few years later. It was worth my effort, however, because we all found it fascinating to analyze the biggest and best efforts from the nation’s top advertising agencies. Within that context, I don’t claim that it’s easy to design a successful advertising campaign. In fact, it must be amazingly difficult to sell something, even to a small portion of the public, considering that even that small portion consists of individuals with a great diversity of perspectives. Take, for example, a campaign to sell cancer services. One may think that a billboard for a cancer clinic would have a relatively homogeneous audience (cancer patients). A short minute of thought, however, would probably lead one to realize that cancer patients, even, for instance, breast cancer patients, come to the highway with a wide range of experiences and outlooks. Thanks to breakthroughs like Herceptin, some breast cancer patients have been told that their chances at a long life are quite good. But others face metastatic disease and they have been given time frames that they and their loved ones can barely comprehend. Today, thanks to a Facebook post, I saw a photo of a billboard that is on the side of the highway somewhere in Wisconsin. This is the photo, taken by a breast cancer survivor, Nancy Stordahl, who writes a blog that I may read if I ever get up my courage to. You can see the image and read the print. A beautiful, young, happy, and healthy-looking woman, (with long hair, mind you) who "never gave up." "So her cancer did." Since this afternoon, my reactions to this billboard have been all over the map. At first, I just thought about how dumb and ridiculous it was. I wondered what group of clueless bozos thought this was a good idea. Then I got back to my work. As my mind drifted back to the sign, however, I couldn't help but connect it with some terrible news I heard yesterday from a dear friend. When my mind made the connection, an anger in me started to brew. Yesterday, I met up for coffee with a friend of mine who I haven't seen in far too long. Without going into details (my friend's privacy is important to her), my friend told me that her mother's breast cancer had returned and was in her bones. We both know the seriousness of this sort of a diagnosis so we sat in Starbucks and cried together intermittently for over an hour. We were completely oblivious to everything else going on around us, and we wiped our huge tears with brown paper napkins. Today, as my mind continued to dwell on that stupid billboard, I thought about my friend's mother, who I will call "Monica." I wondered how Monica would feel driving by that sign. I ultimately concluded that I have no idea. Perhaps she would feel inspired by it. Perhaps she would feel, "Yes, right, I will never give up!" Or perhaps she wouldn't even care what the Mayo Clinic had to say. I don't know Monica enough to know how she would feel about that sign and Monica, like every person, can speak for herself. Still, tonight I wanted to take the time explain what I think is wrong about that sign; why I would probably join Monica or my friend, or even my own mother, if they ever flipped the bird to a sign like that. One wrong thing about that sign is that it boils down a very complex experience into a misleadingly simple one. It's especially stupid because if we could beat cancer by sheer determination, the disease would have been erradicated decades ago. Obviously, however, we can't, and in her blog, Nancy explains much of that so nicely that I will not repeat it. I will, however, offer my own additional thoughts on the matter. 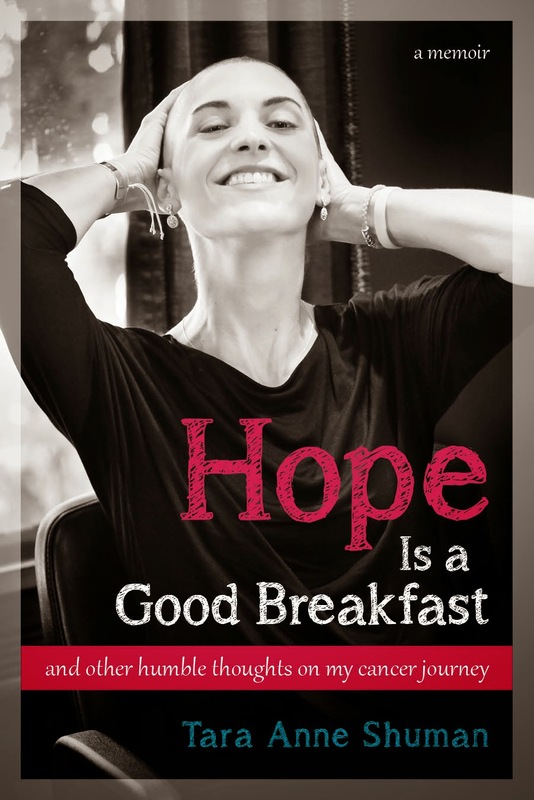 When I was first diagnosed with cancer, catch phrases about beating cancer were like spinach to my hope muscles. Battle Mode. LiveStrong. Total recovery, Full stop, Checkmate, I win. These small words were wonderfully powerful to me. They helped me believe that I would live. That cancer would not kill me. They helped me believe that I could control my own destiny. That I could be strong and my doing so would make a difference in my future. At the time, I needed that sort of simplistic clarity, mostly because I couldn't process the complex grey area in which I lived. I couldn't process the future. I was in my own individual survival mode, and in that mode, I needed to believe one thing and one thing only -- that I could beat cancer. That I would beat cancer. Gradually, for better or for worse (I have no idea which), I evolved. I emerged, reluctantly, from my cancer cocoon and started to see the complexity in so much of this awful disease, or better yet, in the beautiful and tragic life and death that the disease can touch. "Total recovery" and "I win" came to mean something so much deeper to me than avoiding death-by-cancer. In fact, I'm still figuring out what they mean, but I know the answer is not something that can be summed up in a blog, and it definitely wouldn't fit on a bracelet or a billboard. The truth is that I struggle every day to walk a fine line. On one side of that line is acceptance of the reality of a deadly disease. On the other side is sheer defiance of that very same reality. Now that I think about it, I guess that means that the line itself is reality. It's that path that our bodies must physically walk as a million forces try to pull our spirit in equally as many different directions. 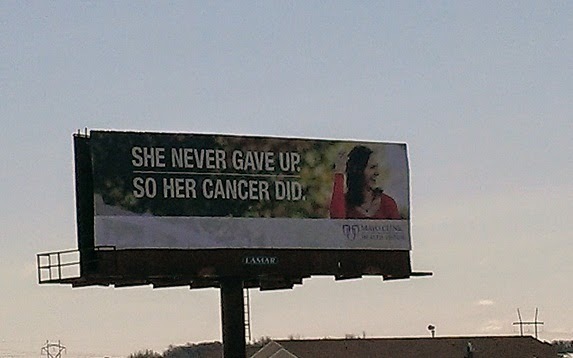 One such force that tugs at me makes me want to write to the Mayo Clinic and tell them what a bunch of dopes they were to put up a billboard that could be so offensive to so many cancer patients, victims, and their loved ones. "Seriously, people, what were you thinking? Have you ever known anyone who died of cancer? Can you see how this billboard could suggest that those people 'gave up'? Hello in there? Anyone home?" I doubt that there was an ounce of malicious intent behind that billboard, however, which is why in the end, my anger about it was short-lived. I'd have to guess that someone simply dropped the ball in not running a draft of the billboard by a few cancer patients or caregivers. Because I'm confident that anyone who has touched the world of cancer, particularly, metastatic cancer, would have told them to find a new approach. Like ASAP. Another force that tugs at me is one that tries to convince me to just find my own inner peace and ignore the hype around something like this billboard. Don't bother with it, the voice tells me. Just focus. Focus on today, on your family, on your book and on your work, on things you can do to really help, on things that make you happy. The billboard is just a stupid sign on the highway; a total fail by an advertising company that forgot to consider a large portion of their audience -- the portion for whom cancer is not curable no matter how much they hope or wish or pray. In the end, I realize that the stupid billboard did what almost all advertising does -- it painted an image that was not real. Anyone who has ever seen a McDonald's billboard and then ordered a Big Mac shouldn't be surprised. We all know about airbrushing, don't we? Yet we are surprised because we think that people who work in the cancer field should know better. Selling cancer services is not like selling soda or paper towels or age-defying face cream, and we're disappointed when the advertisers and those who hired them miss that point so badly. Disappointment. Yes. Disappointment. I guess that best sums up my feelings about the billboard. Disappointment. The concept also only barely sratches the surface of what I feel about Monica's recurrence, and Kristin's, and about every situation in which a person's body cannot physically overcome the ravaging effects of a brutal disease. I'm deeply, deeply disappointed. Because more than anything, I wish that the Mayo Clinic message were true. I'll take a soggy, flat hamburger and a papertowel that can't clean up a spill in one wipe. But I so truly wish that every cancer patient could beat the disease by simply not giving up. Unfortunately, the science just doesn't work that way, at least not yet, and no image or catchy slogan slapped up onto a billboard is going to change that. Finally, since I'm offering criticism, I feel it's only fair to be constructive about it. So, to the likely well-intentioned yet ill-advised Mayo Clinic, here's my two cents (or have I already reached $50.02?). Ditch the picture of the happy woman with long, thick, awesome hair. Ditch the catchy slogan. Ditch the airbrush and the vision of a promise that you can't yet fulfill. Instead, consider something like what I recently saw on a greeting card. Because this sort of honesty will probably make some cancer patients smile, and it may even give them a moment of peace. I've found that honesty has a tendency to do that. Even though it's not as pretty.